Tinted Hydrangeas have clusters of small 4 point-shaped flowers. 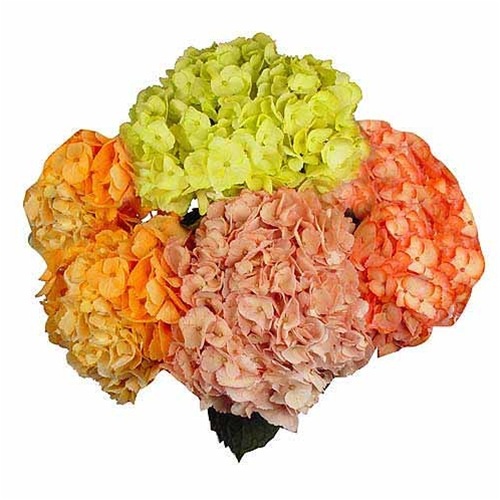 Our fresh cut tinted hydrangeas have big bushy blooms that can be colored to the general color you desire. They make beautiful wedding bouquets, centerpieces and arrangements. Free Shipping! Since these will be dyed to order, we need at least 7-10 days notice. We'll do our best do get the shade you want, but please realize that floral dyes and not as precise as you'll find in a paint store. The characteristics of the individual hydrangea can make a difference, too. Tinted Hydrangeas have a single bloom, a globe composed of numerous clusters of small four-petaled pinwheel flowers with serrated edges. Generally they are a white hydrangea, sprayed with a professional floral paint to give the desired color. They are available year round from our partner farms in Colombia and Ecuador. 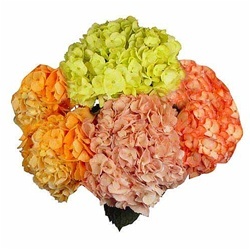 Premium Hydrangea globes vary from 5 to 9 inches diameter.